Much has been written about Mr. Ryan’s intellectual influences: canonical conservative thinkers like Friedrich von Hayek, the Austrian economist, and Ayn Rand, the novelist and philosopher. Mr. Ryan’s enthusiasm for themdates at least to his days as a precocious undergraduate at Miami University in Ohio. 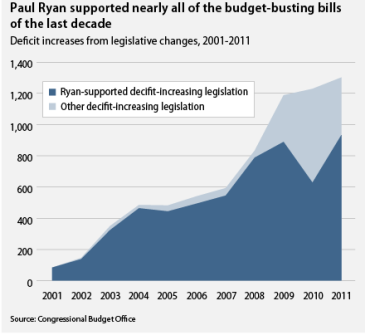 But since first coming to Washington in the early 1990s, Mr. Ryan has been closely tied to an intellectual world more concerned with the political agenda of low taxes, light regulations and small government than philosophical ruminations on work and freedom. There is no denying Paul Ryan, captive of the banking and insurance industries, is fond of light regulations. 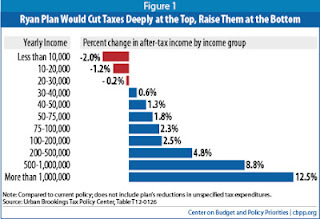 But as the chart below, from the Tax Policy Center indicates, the budget proposed (and passed by the House) by the House Budget Committee chairman would increase income taxes of households under $30,000 while reducing them 12.5% for households with income over $1,000,000. On average, the latter would save $300.000. 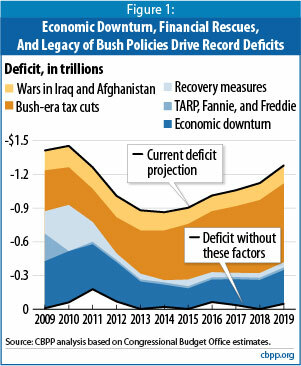 And of course the biggest factor in running up the deficit has been the Bush-era tax cuts, consistently a favorite of Representative Ryan, as illustrated by the graph above from Center for Budget and Policy Priorities. But he's a politician with a radical agenda. I think it makes good sense to take him at his word about what that agenda really is but for some reason the Villagers all want to believe that he's only posturing. 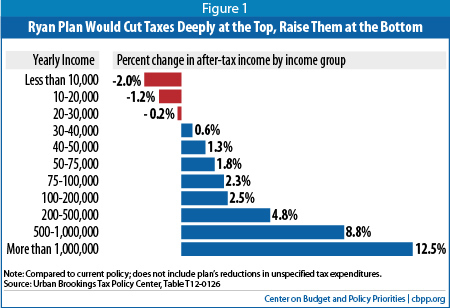 Sometimes I think the GOP cognoscenti who all love him so, believe that too. He isn't. He means it.